449 S. 21st Street , Saginaw, MI 48601 - 912 sq. ft., 3 bedrooms, 1.5 bathrooms. House is ready to live in and price is negotiable! Least price that would be acceptable is $15,000. IF YOU CAN'T CATCH FELICIA CALL CHESTER AT 989-355-1751. THANK YOU! PLEASE SEND ME A TEXT AT (989) 332-7718 FASTEST WAY TO GET ME!!! New cabinets and wood laminate flooring. Large front room, very spacious. Two spacious bedroom and one smaller bedroom. 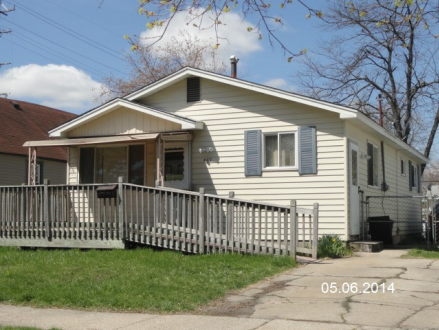 This is a Single Family Dwelling at 449 S. 21st Street in Saginaw, MI. The home has 3 bedrooms, 1 full bathroom, and 1 half bathroom. It's approximately 912 square feet. Built in 1967, the house sits on a 40.00 acre(s) lot, and its real estate taxes are approximately $528 annually.